In a post last week the Irregular Times questioned if Green Party candidate Patrick Quinlan is actually serious about his run for governor. When you compare what he has done so far with the legwork that Lynne Williams has been putting in the answer, as Irregular Times points out, becomes clear. Williams has a campaign website that solicits donors and volunteers. She has an active Facebook group and (although I don’t understand the need for or substance of this) twitters about campaign activities as well. Lynne Williams has submitted her July 2009 Pre-Election Semiannual campaign finance report, which was released to the public this afternoon. The report shows 31 contributions of more than $50, none more than $100, including Tom Hayden (yes, that Tom Hayden). 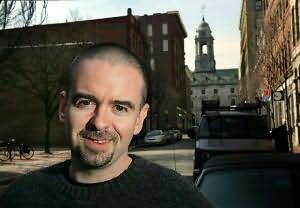 Patrick Quinlan has a website, but that website makes no mention of him running for public office (the website promotes his three novels and one co-written memoir). Quinlan’s MySpace page similarly makes no mention of a gubernatorial run. A blog of his mentions him “thinking about running for Governor of Maine” and “whether I ultimately run for Governor or not,” as late as June 23 of this year, long after Lynne Williams’ campaign was effectively up and running. Quinlan’s required Pre-Election Semiannual campaign finance report has not yet been posted. There’s a lot of time left in the 2010 election cycle, but judging by the status of candidacies today, it looks as though there may be just one major Green Party candidate for Governor of Maine in 2010. It’s true. I tried my damnedest a while back to write something about Quinlan, but there just isn’t anything out there. Unless you are curious about his most recent tome that is. Quinlan does have a blog, with two posts; one about his book and the other about peak oil. Maybe Quinlan is just hanging back, seeing what moves his competitors make first. A little strategery maybe? My gut tells me Williams can probably put away the Pepto and relax.